OAKLAND, Calif. (AP) — Stephen Curry dribbled every which way and ran a circle around LeBron James, then drove left through the paint and beat him to the rim for a right-handed layup over the star’s outstretched arm in a move reminiscent of his recent MVP magic. Steve Kerr got a front-row seat again for the show, delighted to be back on the bench witnessing those signature moments he has seen so many times before. Kerr watched his Golden State Warriors grab a 2-0 lead in the NBA Finals by downing the Cleveland Cavaliers 132-113 Sunday night in another rout, returning to the sideline with a warm welcome from the sellout crowd after a six-week absence. Their leader and reigning NBA Coach of the Year assuming his usual courtside seat, Curry received a special request from Kerr: “to play with passion and play with joy,” Curry shared. 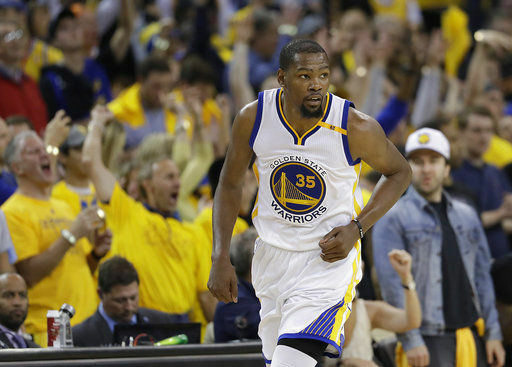 Curry and Kevin Durant tag-teamed the Warriors within two victories of another championship. Curry recorded his first career postseason triple-double with 32 points, 11 assists and 10 rebounds, while Durant contributed 33 points, 13 rebounds, six assists and five blocks and is suddenly on the cusp of his first ring. Golden State improved to 14-0 this postseason and is trying to become the first group to go unbeaten all the way to a title. James was equally spectacular with his own triple-double of 29 points, 14 assists and 11 rebounds, but yet again didn’t get nearly enough help to keep up with the Warriors’ depth. Kevin Love had 27 points and Kyrie Irving 19. James tied Magic Johnson for most NBA Finals triple-doubles with eight, and this marked the first time in NBA history more than one player had a triple-double in the same Finals game. Thompson emerged from a postseason-long shooting funk to score 22 points with four 3-pointers while playing more stellar defense and pulling down seven rebounds for the Warriors, who shot 18 for 43 from deep. Curry provided Kerr more than a glimpse of his greatness from up close after the coach had been watching games from the locker room while speaking to his players beforehand and at halftime. On that third-quarter drive, James had little help as Love got there late. Curry made all 14 of his free throws. He and Durant combined for 66 points and 18 assists in the opener, then dominated again while the supporting cast shined. Curry was upset by his eight turnovers as Cleveland vowed to put more pressure on the ball and keep Durant from driving and dunking untouched as he did so many times in Game 1. 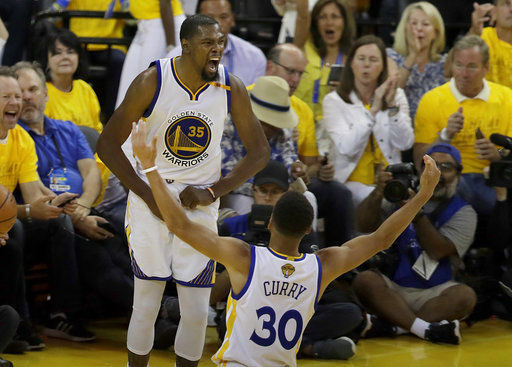 Having Kerr there sure did — the Warriors felt whole again. 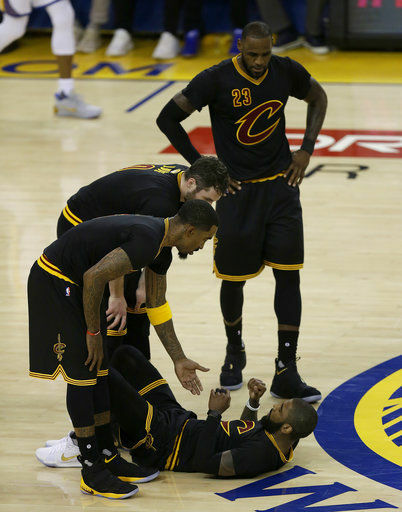 Cavaliers: Tristan Thompson scored his first points of the series on a driving dunk midway through the first quarter. … Cleveland shot 3 of 20 on 3s in the first half and 8 for 29 total. Warriors: The Warriors had their first 40-point quarter in the Finals since scoring 41 in the first quarter of Game 6 in 1967 against the 76ers. … Curry’s 10 first-quarter free throws equaled Paul Pierce for most in a Finals quarter. … Thompson played in his 78th postseason, most in franchise history.